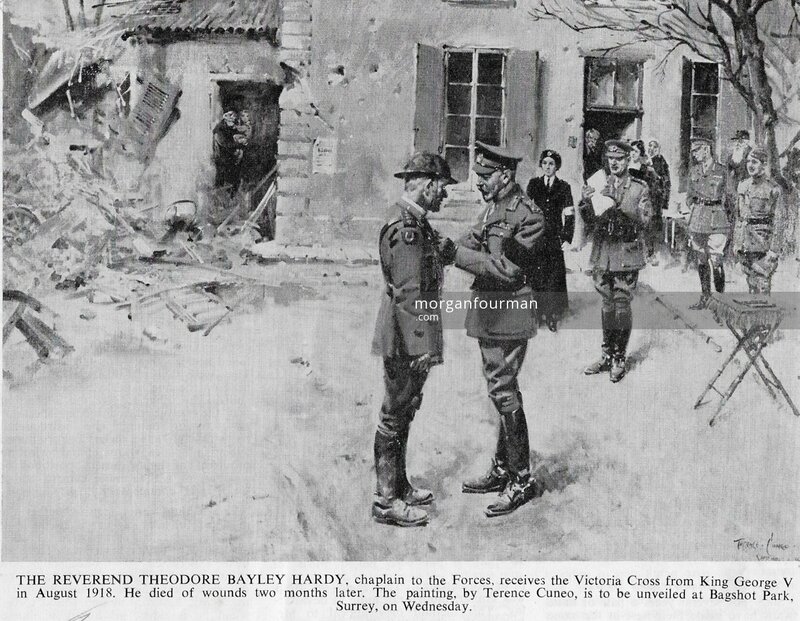 Elizabeth Hardy was born on 5 Jun 1889, the only daughter of Rev Theodore Bayley Hardy, VC Before 1914 she worked as a schoolmistress, having obtained a degree from London University. After war broke out, she trained with the Red Cross in London and later joined the Queen Alexandra Hospital in Dunkirk on 7 Feb 1917. She became a life-long friend of Molly Evans. She appears in the picture of helmeted nurses in Molly’s unit in 1918 and is frequently mentioned in Molly’s diary, including the time they went together to the RAF band concert on 4 Oct 1918. 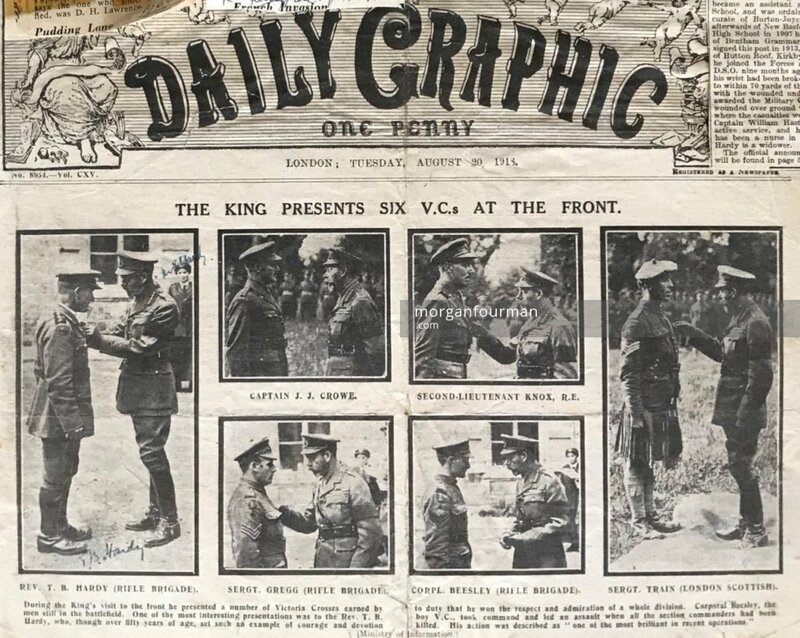 She is also depicted in the photographs and 1967 painting of her father receiving the Victoria Cross from George V at Frohen-le-Grand on 9 Aug 1918. Went up to see Hardy. Got her ready for her visit to the King, swept her, removed straws, lent her things – 2 cars awaiting her pleasure in the courtyard! Rumours of Bruges being taken. [Rachel] Wilson told me Mr Hardy was dead – did my work routine mechanically – could think of nothing but Hardy..
Elizabeth officially left the Hospital on 29 Oct 1918, but Molly records that she was “sent for” on 12 Oct. This was the day after her father had been wounded and evacuated to Rouen. Indeed Molly records on 16 October that she wrote to her. 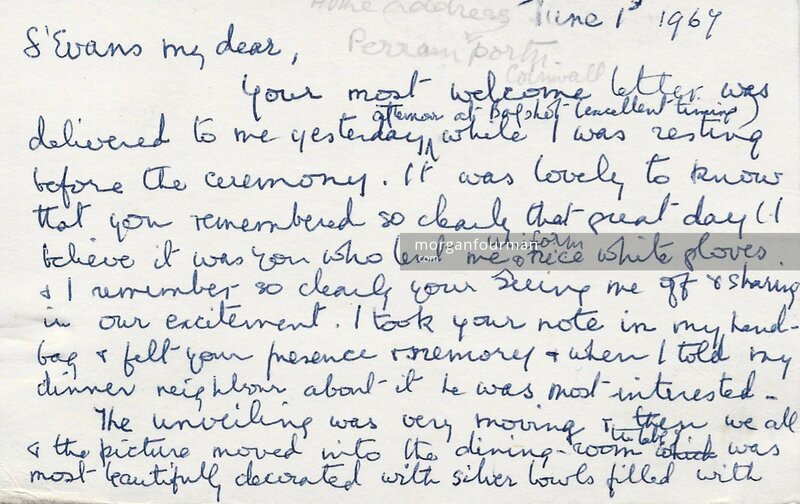 Two years later Molly’s diary records that Elizabeth came and stayed at 16 Woodbourne Road, Edgbaston on 23 Oct 1920. They spent the evening with ‘Mr and Mrs Paul Cadbury‘ ie Rachel Wilson and her husband, both of whom had served in Dunkirk in the Friends’ Ambulance Unit. Both Rachel and Molly had married in 1919 and were already both nursing young babies. Elizabeth Hardy like many others of her generation never married. She became headteacher of a girls’ school in Rangoon, driving to India to safety in 1942 ahead of the Japanese invasion. Later she became head of a school in Bangalore. She visited Noel and Molly at Upton from 5th to 7th February 1954 giving her address as Bishop Cotton School, Bangalore, India. A year later she retired to Perranporth in Cornwall and continued to visit Molly again in 1955, 1959 and 1961. It looks as if Molly renewed their mutual friendship when she learnt of the painting by Terence Cuneo in 1967. 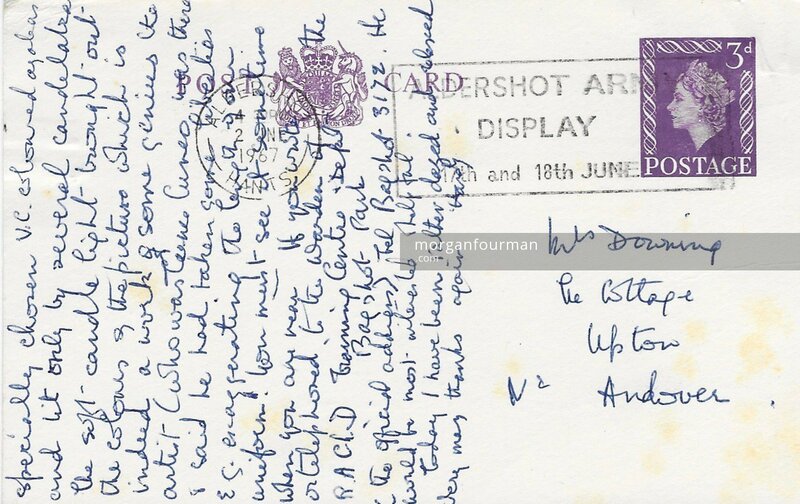 She kept a copy of ‘The Field’ of 25 May 1967 that announced the forthcoming unveiling at Bagshot on 1 Jun 1967. Your most welcome letter was delivered me yesterday afternoon at Bagshot (excellent timing) while I was resting before the ceremony. It was lovely to know that you remembered so clearly that great day! I believe it was you who lent me uniform and nice white gloves & I remember so clearly your seeing me off & sharing in our excitement. I took your note in my handbag & felt your presence & memory & when I told my dinner neighbour about it he was most interested. The unveiling was very moving & then we all and the picture moved into the dining room – the table was most beautifully decorated with silver bowls specially chosen VC coloured azaleas and lit only by several candelabra the soft candle light brought out the colours in the picture, which is indeed a work of some genius. The artist who was Terence Cuneo was there and he said he had taken some liberties – eg exaggerating the length of the uniform! You must see it some time when you are near. If you wrote or telephoned to the Warden of the R.A.Ch.D Training Centre and Depot, Bagshot Park (The Official Address) Bagshot 3122, he would be most interested and helpful. Today I have been rather dazed and relaxed. Very many thanks again. It was delightful to have your letter which brought back very pleasant memories of your lovely home. I should love to see you again. I feel its peace. I very nearly did a few month’s ago for an hour or two. At the dinner on the “unveiling” occasion I was sitting next to the Minister of Defence & I told him of how I had your charming letter in my evening bag & felt that you were with me. Hearing that you lived near Andover he said “We must get a car and send you there to see her” but I managed to dissuade him as I did not know if you were at home and I also knew that all the cars at Bagshot were involved in a conference to be held that week (I had not taken my car to Bagshot). I was glad to know that you were thinking of Perranporth. [……….] Do come and see it. I could arrange for you to stay at a Guest House near here and it would be lovely to see you & talk. Much love and Christmas wishes. Elizabeth Hardy. She died in Perranporth in 1972.